Welcome to our new quarterly e-newsletter. We’ll be reporting on stories about the help being provided in Alameda and Contra Costa Counties. We’ll also promote the latest events, trainings, or news coverage. Please enjoy these stories which show a sample of the difference employees, volunteers, and other supporters are making for children, families and seniors around the East Bay area. We hope you like what you see, and we’ll be back regularly with more. 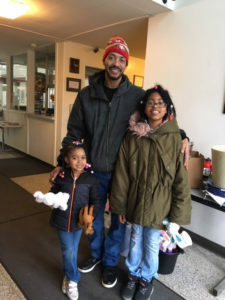 Jay, a father of two, had been homeless for the past two years. While his children were cared for by family, Jay couch surfed as often as he could, regularly sleeping in his car when nothing else was possible. After getting a better paying night job for a local company, Jay found an apartment he could afford, but he needed money for the security deposit. That is where Catholic Charities came into the picture. Annie Banbury, one of our housing specialists, helped get Jay the security deposit needed to secure the lease. She also applied for Season of Sharing funds to pay for beds. Annie then reached out to donors for some of the other basics needed to make a house a home. Jay agreed to meet Annie at our Oakland office a few Saturdays ago to pick up the household donations for the new place. That same Saturday, a committed volunteer, Lydia Kearney, had organized a volunteer event at Catholic Charites. 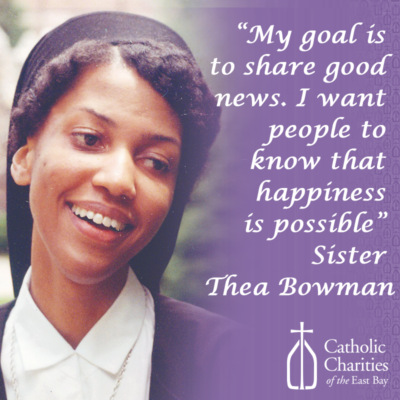 She had brought a team of eight young professionals, who attend St Augustine Catholic Church, to the Oakland office for a day of organizing and clean up. When Jay arrived to meet Annie, his young daughter in tow, he saw the work being done by the volunteers, and he got to meet the team. The volunteers wanted to help Jay, too. They went out and bought new household goods for the family and gave the children new books and art supplies. Jay was ecstatic. However, the volunteers also got much more than they had expected from their day at the office. They were overjoyed to be able to make a difference for Jay and his daughters. With rising housing costs and stagnant incomes, people find themselves at greater risk of homelessness if they lose their job or their rental. At Catholic Charities, our employees, volunteers, and interns find many opportunities to make a difference in the lives of our community members. Whether it’s housing intake or qualified legal counsel on immigration matters or working with families, young people, or schools harmed by community violence, we’re there to help. 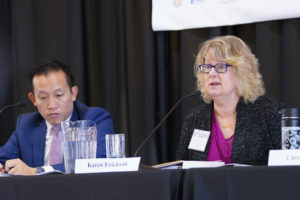 On Thursday, Feb 28, 2019, Karen Erickson, Housing Director, Catholic Charities of the East Bay, was a panelist at California Housing Crisis, a day-long conference held in Sacramento, CA and sponsored by Capitol Weekly. Karen joined Assemblymember David Chiu, Adrian Covert of the Bay Area Council, Anya Lawler of the Western Center on Law and Poverty, and Chris Martin of Housing California to speak about the homeless crisis and strategies that are working. On March 11-13, Christopher Martinez, Chief Program Officer, Catholic Charities of the East Bay, spoke at The Catholic Immigrant Integration Initiative Conference about support for refugees. The Conference is about understanding, expanding, and strengthening the work of Catholic institutions with immigrant communities. The event took place at Santa Clara University School of Law. Mental Health First Aid trainings help community members respond compassionately and directly when someone experiences a mental health challenge. Catholic Charities’ Mental Health First Aid facilitators add restorative and culturally-aware ideas and discussions into these trainings. Trainings can be offered in Spanish or English. Adult Mental Health First Aid courses are only $75 and include meals and all materials. Click button below for a list of our upcoming trainings. 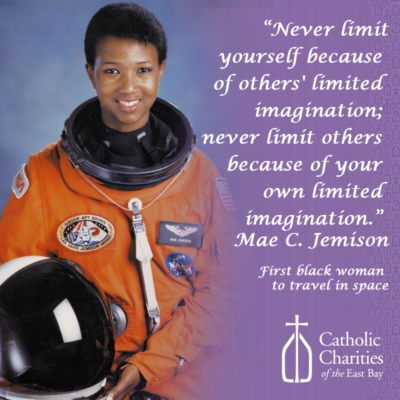 we reflect on the words of two powerful African American women.